Gold has been under pressure due to the ease of tensions between Italy and the European Union and the empowerment of USD. The support rests at 1198.00 with resistance at 1205.40 which both lines are above the weekly pivot point at 1191.43. 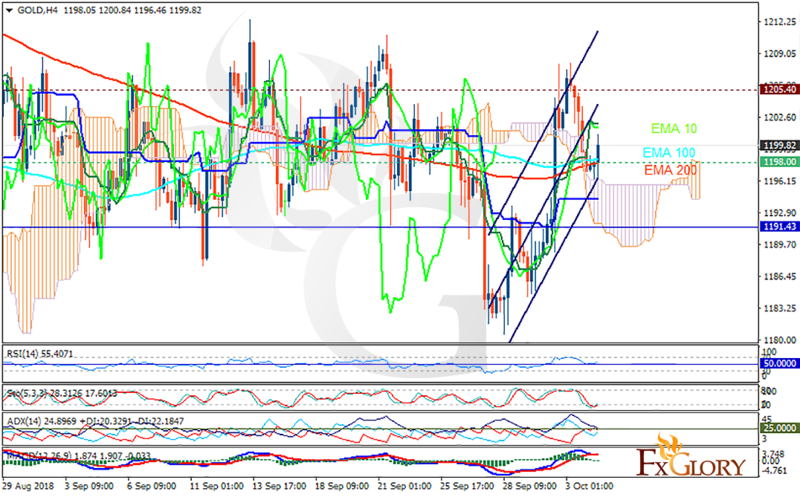 The EMA of 10 is moving with bearish bias in the ascendant channel and it is above the EMA of 100 and the EMA of 200. The RSI is rising above the 50 level, the Stochastic is moving in low ranges and the MACD line is above the signal line in the positive territory. The ADX is not showing any clear signals. The price is above the Ichimoku Cloud and the Chinkou Span. The Tenkan-sen and the Kijun-sen are both showing a horizontal trend. the support level breakthrough will push the pair down towards 1195; otherwise, the correction pattern will start targeting 1206.